A herniated disc is one of the most common injuries in automobile accidents. The impact of the collision puts excessive stress on the spinal column and causes a disc in between the vertebrae to move out of its normal position. These injuries are often diagnosed as slipped or ruptured discs. Herniated disc injuries can be very painful, with symptoms ranging from acute pain in the back, leg, hand, or foot after the accident. These injuries should be treated immediately by a medical professional. These type of injuries, as with many back injuries, can have lifelong consequences. Therefore, treatment can last far beyond the time after the initial accident. In some cases, people never fully recover from their back injuries. Back pain If you feel sudden and acute back pain ranging from strong to intense, you may have suffered a herniated disc. Lower back pain Lower back pain is one of the most common symptoms. The discs most likely to suffer this type of injury are at the bottom of the spine. Leg pain Ruptured discs in the lower back put pressure on the sciatic nerve and cause intense pain that extends from the legs into the feet. Chronic pain If left untreated, herniated discs can cause chronic pain and numbness. Numbness This type of injury can cause numbness in the back, hands, and legs. You may feel this numbness in your hands and fingers, or calves, feet, and toes. Depending on the severity of the injury, treatment for c4-c5 injuries can vary. Sometimes, the arm and shoulder pain associated with a cervical herniated disc can be controlled with medication and non-surgical treatments. This “conservative” treatment can also includes physical therapy, targeted exercise, cervical traction, steroid injections, the use of braces, chiropractic manipulation and osteopathic medicine. However, if these options are not enough to relieve the pain, surgery may be required. Most medical experts agree that if arm pain due to a cervical herniated disc last longer than six to 12 weeks, spine surgery may be an option. 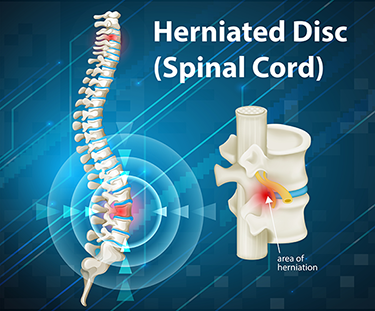 Surgeries for herniated discs range include anterior cervical discectomy and spinal fusion, posterior cervical discectomy, and cervical artificial disc replacement. How much can I expect from my c4-c5 herniated disc settlement? Herniated disc settlements are some of the most common in personal injury lawsuits, but the settlements can range considerably depending on a number of factors. The key to herniated disc settlements is proving indefinitely that the accident caused the injury, that the injuries are significant, and that the injured driver was not at fault. If this is the case, you are likely to get a more significant settlement. Many insurance company attorneys will go to great lengths to discover any pre-existing problems or symptoms you may have had related to another back injury, and attempt to discredit your claim or argue for a reduced settlement. What damages are involved in a c4-c5 settlement? Compensation for c4-c5 injuries can include economic and non-economic damages, which are usually lumped in a single settlement. After your accident, you should also make sure to follow the instructions and medical recommendations of your doctor, such as physical therapy and pain medication. If you don’t follow the doctor’s advice, your compensation could be reduced because you neglected to properly care for your injuries as instructed. We can help you understand how these types of damages work and ensure you receive a fair settlement for your c4-c5 herniated disc injury.